When preparing your cupboards for bread baking and stocking up on supplies, you'll find that herbs and spices can be pricey. The trick is to only stock up on the items you know you will use. As you gain more experience at bread baking and discover more flavors, you will add to this list of the most basic herbs and spices. Allspice was discovered by Christopher Columbus and brought to Europe for use in the early 17th century. Ground allspice can be used to flavor yeast breads, but it is more often used in sweet quickbreads. Loved for its strong licorice flavor, aniseed is used whole or ground in yeast and quickbreads. This spice is often used in traditional Christmas bread. A strong herb, basil is commonly used in bread stuffings and butter. It can also be added, fresh or dried, to yeast bread. Caraway seeds are most often added to rye bread. They add more flavor to rye bread and are sometimes used to top rye bread as decoration. Caraways seeds can also be added to cornbread, orange yeast bread, and biscuits. Ground cardamom is commonly used in sweet bread and is a popular Christmas spice. It is also used in some coffee cakes and in gingerbread recipes. Ground cinnamon is a popular spice used in bread baking. Cinnamon can be added to both yeast and quick breads, waffles and pancakes, and is often used in dessert bread. Ground cloves can be used in yeast bread, but it's more popularly used in quick breads. This spice is often used in Thanksgiving and Christmas bread, and it can be added to waffles, pancakes, and muffins. Garlic powder or minced garlic is a must have when making toasted garlic bread. Garlic can also be added to yeast bread, biscuits, and pizza dough. Like cinnamon, ground ginger is a very versatile spice. It is used in some yeast bread, but it is mostly used in quick breads, muffins, pancakes, waffles, and coffee cakes. Crystallized ginger is also used in breads, both yeast and quick. Ground mustard not a common ingredient in most bread recipe books, but it is a wonderful addition to many types of breads. Ground mustard can be added to yeast bread, pretzels, muffins, and cornbreads. Ground nutmeg is often added to sweet bread. It is used in quick breads, french toast, muffins, waffles and pancakes, and coffee cakes. Poppy seeds are commonly used as ornamental seeds on yeast bread but they can also be added to yeast dough. They are also used in bagels, cornbread, and in sweet bread. 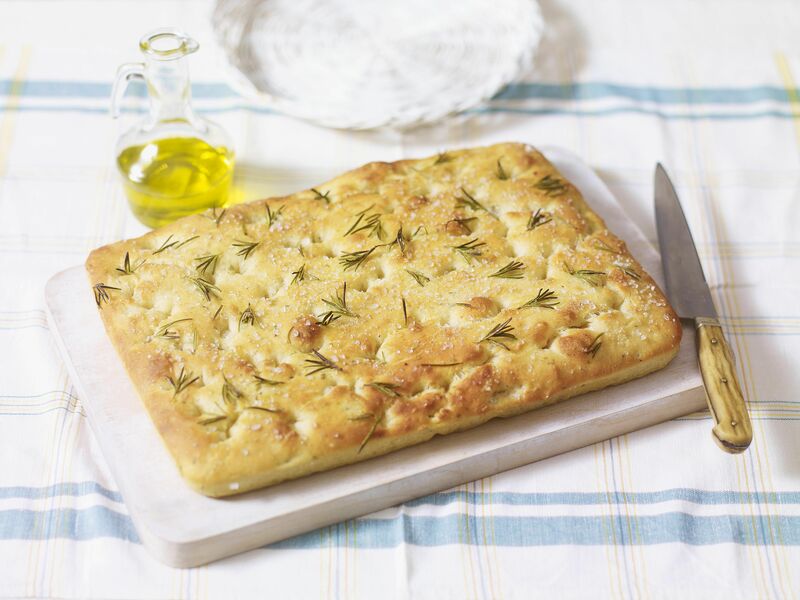 Rosemary is a favorite herb to add to yeast bread. The fresh or dried herb can be used when making toasted garlic bread, in onion or cheese bread, and in white or wheat breads. Sage is a mild herb commonly used in bread stuffing recipes. Ground sage is a delicious addition to orange bread and herb bread. Like poppy seeds, sesame seeds are commonly used to decorate the tops of bread. White bread, wheat bread, and rolls are often topped with sesame seeds. Sesame seeds can also be added to bread doughs. Not surprisingly, vanilla extract is a great addition to many different kinds of bread. The extract can be added to yeast doughs, quick breads, coffee cakes, waffles and pancakes, and muffins. It is also used in the icing that tops many dessert breads.